"A Detective with nothing more to lose, against a Necromancer with a world to gain." It’s a year later, with her life shattered and her career in ruins, her last shot at redemption has gone terribly wrong. Heather is sent in disgrace to the high North by the Church she serves. And what peace is to be found in that quiet arctic outpost is all too quickly broken, as her past comes hunting for far more than her, this time. Overwhelmed by grief and outgunned by a necromantic conspiracy, Heather must fight for the survival of those around her, while searching for a reason to survive. And in the end, she'll have to decide: Does the necromancer who butchered her husband and son deserve a Detective's justice, or a mother's revenge? A webfiction serial, published weekly, From Winter’s Ashes offers a rich world where emotion fuels magic and great spirits walk the earth, all while telling the human tale of one mother’s struggle to put her family to rest. 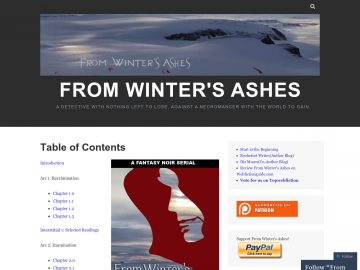 From Winter's Ashes has not been reviewed yet. From Winter's Ashes has not been recommended yet.